While there is a tendency to look back and reminisce, looking back can often get us into trouble. In fact it can be fatal. The danger of disciples of Christ looking back is an oft-repeated warning in the Bible. The context involves three different people who wanted to follow Jesus. The first man was a scribe (Matt 8:19) who said, “Lord I will follow you wherever you go.” But when Jesus responded, Foxes have holes and birds of the air have nests, but the Son of Man has nowhere to lay His head.” The man recanted. Apparently, that kind of lifestyle wasn’t for him. Maybe he had a nice home and enjoyed a comfortable, easy life. Being a disciple of Christ involved too much self-sacrifice. The second man was actually called by Jesus. What an honor. However, he replied, “Let me go and bury my father.” Jesus retorted, “Let the dead bury their own dead, but you go and preach the kingdom of God.” In other words, let those who have no interest in spiritual matters attend to this physical chore. While this on the surface sounds harsh, Barclay suggests that perhaps his father hadn’t died yet. Traditionally, the Jews buried their dead on the very day of their death. So, why was this man among the crowd as Jesus passed by? It seems what all of these men had in common was excuses. They had a problem with priorities. They were lacking loyalty to the Lord. Their attention was diverted. Their hearts were divided. Their focus was distracted. Their “commitment” lacked true devotion. Dedication. And denial of self-interest. The problem of looking back is nothing new. It is as old as Lot’s wife, who disobeyed the Lord and longingly looked back at the sinful cities of Sodom and Gomorrah , which they were commanded to leave behind. Don’t look back at your sinful life. Don’t yearn for those days again. Leave them behind. Your ungodly friends. Your lustful habits. Your worldly ways. Your materialistic goals. Your carnal attitudes. Forget them. Don’t look back. 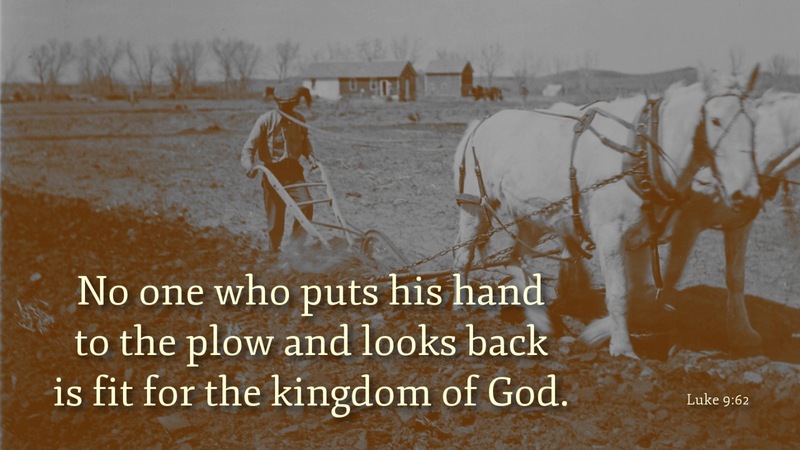 As a boy growing up on the farm in central Indiana, I can relate to Jesus’ analogy of plowing a straight furrow. You don’t look back. If you do, it will be crooked. You keep your eyes straight ahead. Dad taught me to pick an object to fix my eyes on in front of me. A fence post. A tree. Something to direct focus ahead. Not behind. The watchword of the Bible, of true discipleship, is “Forward.” Keep moving forward. In this vein, Paul proclaimed, “I press on toward the goal.” In fact, he said that he forgot the past (Phil 3:12-15). Past problems. Past mistakes. Past sins. Past decisions. Don’t look back. It’s the truth. It’s possible to go to church but look back at where you’d rather be. It’s possible to give but look back at how you could use the money for yourself. It’s possible to live a good life but look back and wistfully yearn for the “fun” you’re missing. Let Jesus’ words ring in your ears. Don’t look back. Ken, your articles often have uncanny timing! I’m preparing to teach our ladies’ class tomorrow on surrendering our lives to Jesus and was studying this very verse to use. Thank you for such a great explanation. Thanks, Aleta. Glad it was timely. And helpful. God bless. Ken, I ALWAYS enjoy your daily message. They help me so much. You often mention Barclay, William Barclay. Does he have books or commentaries that I could purchase? Thank you. Yes, Pam, he has several books including his Daily Bible Study series, a commentary on the N.T. It is not in-depth, but is more a devotional commentary. But I like it. He has some good observations and does a good job on word studies and historical background. You can order it from Florida College bookstore. Or, it is available through some computer programs like the PC Bible Study by Bible Soft.